Join in the fun! Learn the simple routine and take part in a World Record attempt for the World’s Largest Samba Dance! As part of the first Stapleton Road Make Sunday Special, Sunday 23 August 2015, organisers are inviting people to get involved in an attempt to beat the current Guinness World Record for the World’s Largest Samba Dance, to take place between 2pm-3pm outside Easton Leisure Centre. 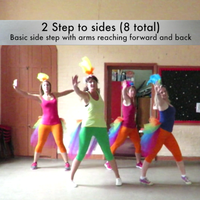 World Jungle Samba Dancers are leading the way with a simple Samba Dance routine that is available online for people to learn the steps. We are also running free 30 minute dance workshop sessions, Wednesdays 5:30pm-6pm at the Trinity Centre in the month leading up to the attempt, for anyone wishing to get involved. We only need to get at least 600 people dancing the same routine to break the record – easy!! It would be great to have as many people from our classes joining in too. Please click here to find out more and to sign up to take part in the attempt. As the end of the school term comes ever closer, the online booking system for our ‘Summer off the Streets’ holiday activity programme is now operational and spaces are already filling up on those workshops requiring reservations. It couldn’t be easier – to book and pay for an activity just go to the World Jungle website (www.worldjungle.org.uk) and follow the link from the homepage. If you don’t have internet access, telephone 01285 623405 for assistance. 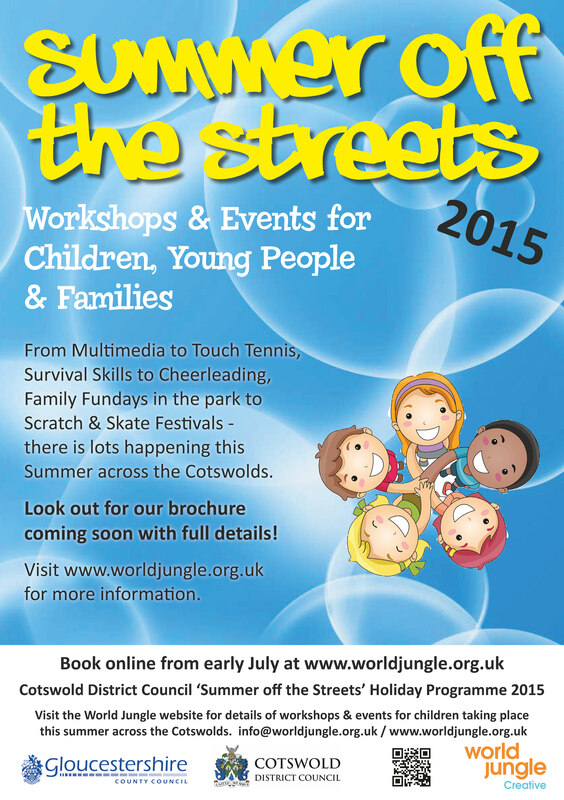 The ‘Summer off the Streets’ programme is run by Cotswold District Council in partnership with World Jungle. It encompasses a varied programme of workshops to suit all interests, together with a whole host of free community fun days and events to keep the whole family entertained this summer. Take a Bow Drama Workshop – 2 pm to 4 pm, Monday 27 July at George Moore Centre, Bourton and 2 pm to 4 pm, Wednesday 5 August at Dolphins Hall, Tetbury. There are also many free activities, most of which do not require booking. These include family fun days at Walnut Tree Field, Fairford on Thursday 30 July, Naight Park, Bourton on Friday 31 July, South Cerney scout hall on Friday 14 August, and King George’s Field, Stow on Friday 21 August.